Last week we spent six lovely, lakeside nights at Heron Lake State Park. Well, it was almost lakeside. The lake water level is at an all time low, so our site was quite far from the actual shore. Despite the lack of water, it’s still a very pretty lake. It was one of those weeks when we didn’t leave the campground at all. One day we drove down to the end of the lake to check out the dam, and a few times we went over to the electric and water loop to use the showers, but other than that this narrow site tucked between the trees was where we spent the week. For most of the week it was just us and the camp hosts, which made for a very pleasant week. We had near perfect weather, with so little wind that for the first time in a practically forever we left our awning out all week. We even both got in a few hours of working outside, which means the weather really was perfect, because we almost never do that. The only sour point came near the end of the week when a fifth wheel showed up and decided to run their very loud (you know the kind they use at construction sites?) generator 3 x a day for several hours at a time. I’ve said it before and I’ll say it again, if you need so much electricity that you must run your generator for such an excessive amount of time, please do the rest of us a favor and pick a site with an electric hook-up! We walked past their site one day and the racket was so ridiculously loud that I commented to Tim, “I don’t know how they can even stand to hear themselves.” Well, the answer was that they were inside with all the windows closed. I don’t get it. Luckily they were several sites away from us, so the noise at our site was only a dull roar. Despite this minor annoyance, we had a wonderful week that we somehow managed to make both productive and relaxing at the same time. 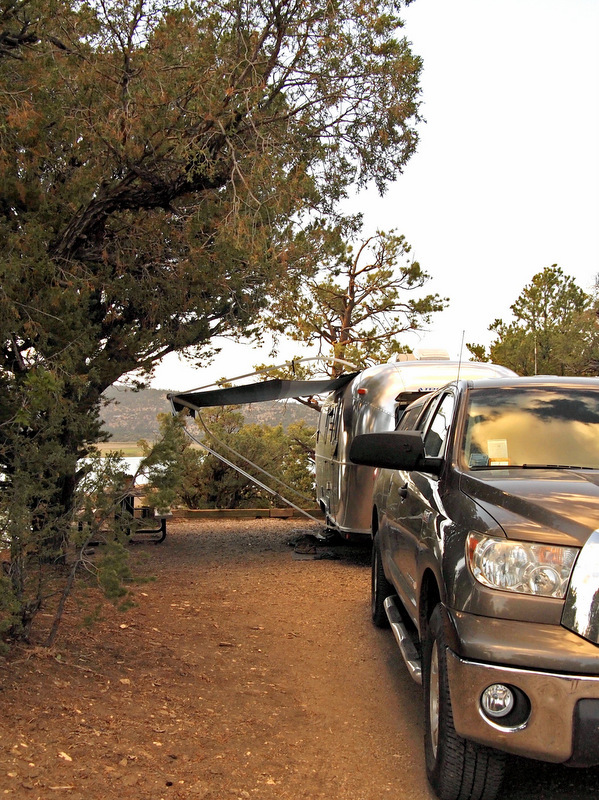 When the weekend rolled around it was our intention to head west for a week long stay at Navajo State Park. On the way we planned to stop in Chama for a look at the famous Cumbres & Toltec Railroad. Except none of that happened because we changed our minds and ended up heading straight to Colorado for some extra time in Durango. Many things factored into this decision, but in the end what really cinched it was the lack of a grocery store between Heron and Navajo Lakes. We often joke that even in our tiny house we carry around enough dried and frozen food to make it though several months without having to re-stock, but that’s only if we want to forgo fresh veggies & fruits. By Saturday morning we were down to a half a head of lettuce, 2 peaches, and some limes. Not enough to make a whole week of meals out of. So it was goodbye New Mexico, hello Colorado for us. 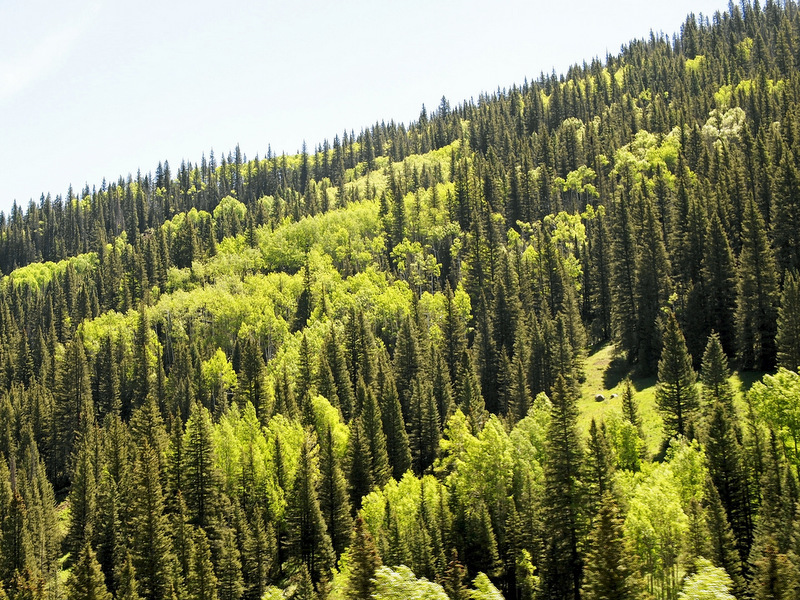 The truth is that the choice to head into Colorado early was about way more than just food. After an amazing four months in New Mexico I think we were both ready to move on. Even in the higher elevations things had been heating up in NM, and we were excited to seek out some cooler temps, bigger mountains, and greener forests. This is part of the reason why it’s hard to imagine living in just one place ever again. Because no matter how much we love where we are, after awhile we get the itch to leave it behind. Of course, that itch is even greater when we already know how incredible our next destination will be. Last summer we spent a glorious two and half months in Colorado, and this year as soon as we crossed the state border I was reminded how much I love for this special state. If you’ve never been here than it’s a little hard to explain, but for those who have traveled around Colorado you know what I am talking about. 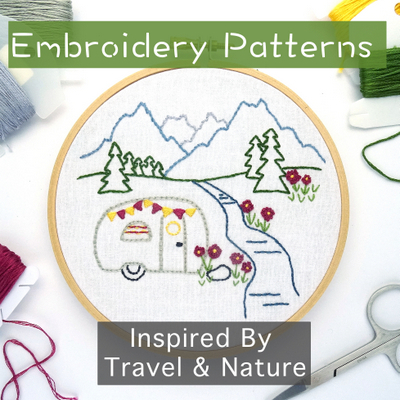 There’s this feeling of overwhelming awe, joy and amazement that washes over me as we drive through a lush green valley with a river rushing beside us, and towering snow capped mountains all around that I have yet to discover in any other state. After a very pleasant 2.5 hour drive, followed by an even longer stretch of running around town doing errands, we arrived at one our favorite boondocking spots about 20 minutes west of Durango. I don’t have any photos of our spot to share yet, but we plan to stay here for a full two weeks, so they’ll be plenty of time to show you around in the coming weeks. Here is the updated New Mexico State Park Fee spreadsheet. 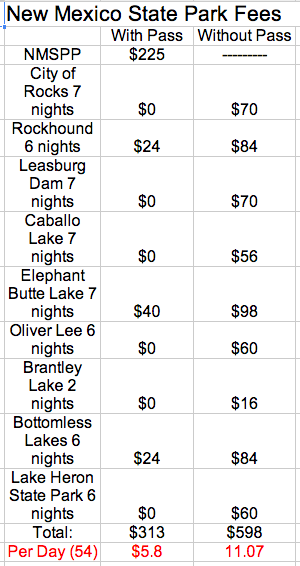 We ended up spending a total of 54 nights in NM state parks with an average cost of $5.80/night. Without the pass our average cost would have been $11.07/night. Still an incredible deal. For a quick refresher from when I first introduced this chart way back in March, here’s how the pass works. 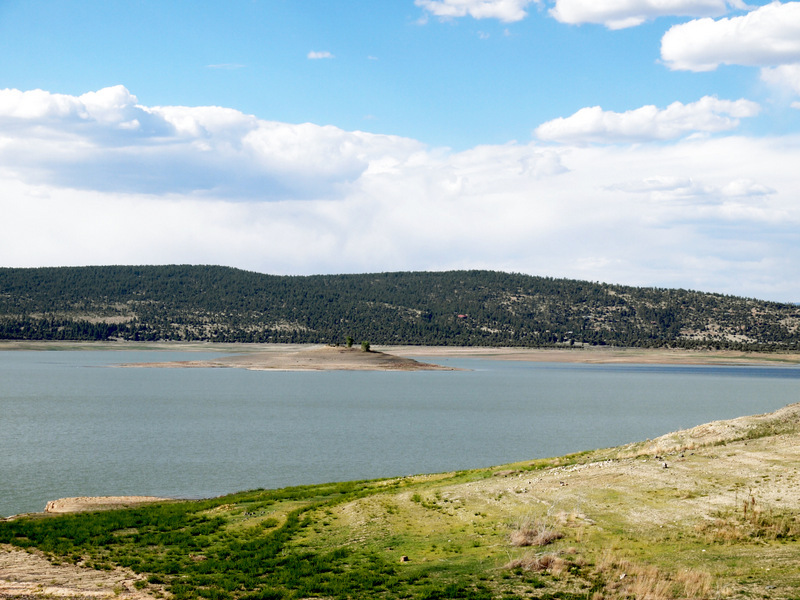 New Mexico offers a non-resident state park camping pass for $225/year ($125 for residents). This pass gives you $10 off the per night fee at all state parks. Most of the parks offer dry campings sites for $10/night, or primitive sites for $8/night. These sites are free with the pass. An electric and water site is $14, or $4 with the pass, and a full hook-up site is $18, or $8 with the pass. There is also a ridiculously high $12 per night online reservation fee for which you receive no discount. Thankfully, all the parks keep about half of their sites available on a first-come, first-serve basis, so unless you really, really want a particular site there’s no need to make a reservation. The pass will pay for itself after 23 nights, so if you’re planning to spend longer than that at New Mexico state parks over the course of one year it’s worth it. The pass ended up saving us $285! We have yet to come across another state that offers a deal even close to this. Thanks New Mexico! We’ll be back. Sounds like a great end to your time in NM…and totally with you on that green rush going into CO. Love me some green after the desert! By the way quick (and maybe stupid) question on your spreadsheet. 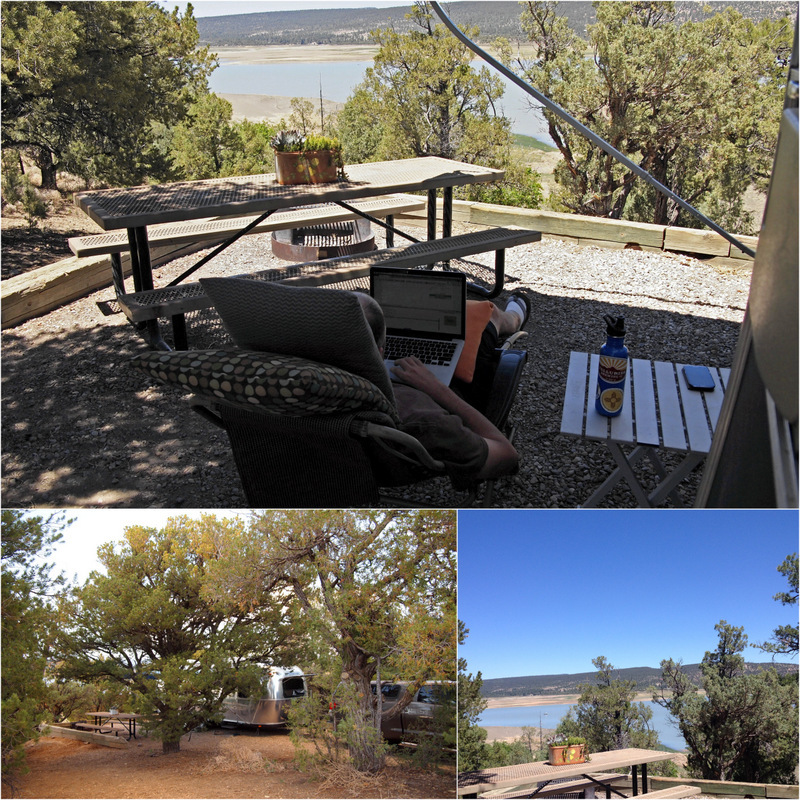 Why did it cost you $40 for 7 nights at a Elephant Butte with the pass? Did you get full hookups part of that time? We made a reservation that week and took an extra $12 hit. I stayed several nights at Heron Lake SP and loved it, too. The married camp hosts were also exceptional. His name was Rusty Irons. I’m not kidding. I had a great time there in 2009. I wonder if it was the same couple! They said they had been hosting there for many years. I forgot their names, but they were so friendly and helpful. I agree, we hate making reservations. We have a tendency to change our minds (I say we, but really it’s more me) a lot and only make reservations if absolutely necessary – like on holiday weeks. It drives me crazy that so many public campgrounds don’t keep some sites non-reservable. Most of the national forest and state park campgrounds are all reservation here in CO. Makes it hard for us to get a site since Colorado is a very popular vacation destination. 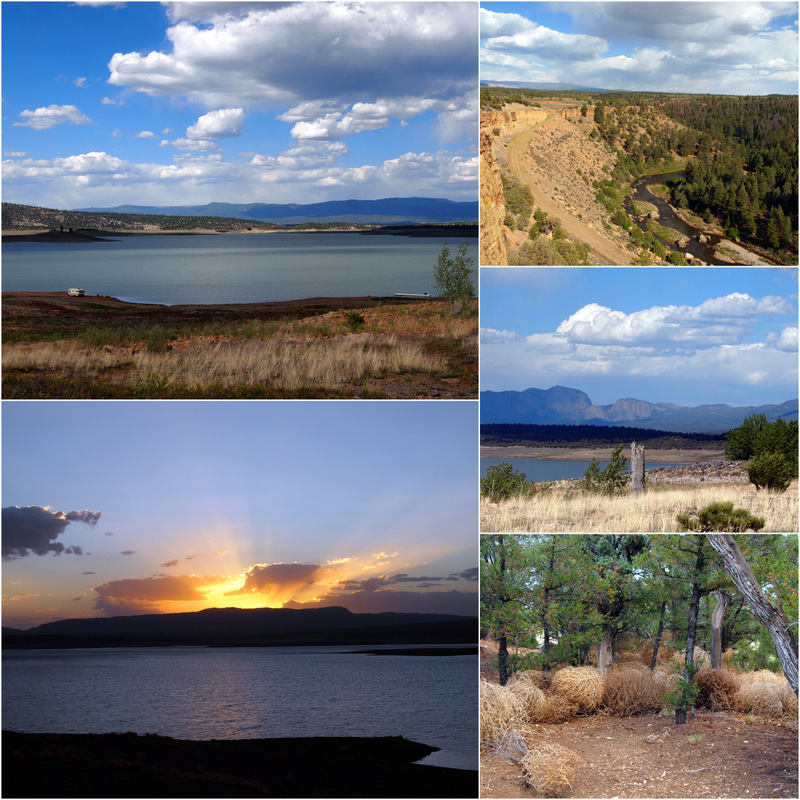 Another reason to love those New Mexico state parks! Thanks for the financial info on NM. We want to go back and spend more time there. Our last time through the weather was horrible. 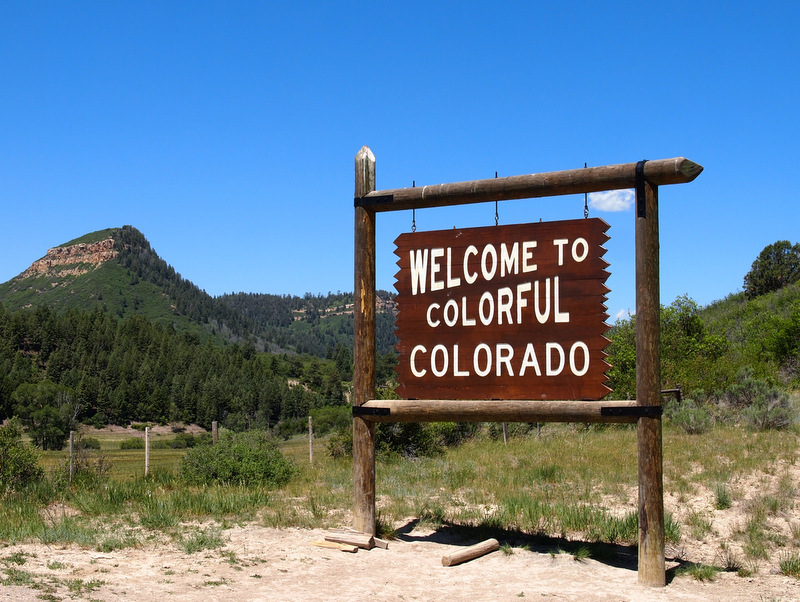 We are also looking forward to exploring Colorado as well. Looking forward to future posts. It’s a state that’s worth spending an extended amount of time exploring. We were surprised by just how much variety we discovered. Sorry for the bad experience with the 5th wheel. Just an FYI for NM State Parks. Please let a ranger know of the issue. What you described as an industrial generator is an affront to your ability to visit the setting of the park violating both Conduct and Noise Limitation Rules regarding what is reasonable. As a Ranger working for the parks I generally will ask that those generator sets be kept off as inappropriate to other visitors and encourage the user to try one of our remote primitive sites that do not have visitors anywhere nearby..and suggest that they get an electric site if we have one available. If a Ranger has not noted the issue please let us know instead of fuming. We want your experience to be the best. A. Park “quiet hours” begin at 10:00 p.m. and end at 7:00 a.m. Visitors shall not operate generators, radios or unmuffled vehicles or engage in other loud activity [disturbing others] during this time period. B. Except in case of an emergency, creation of loud noise through the use of a loudspeaker requires the superintendent’s advance written approval. Visitors shall operate radios, tape players or other sound producing devices at a reasonable level during non-quiet hours so as not to disturb other visitors. Thanks for the reply. Since they weren’t violating the quiet hours I wasn’t sure if we had the right to complain. Next time we’ll definitely report it to a ranger or camp host. You can definitely camp at Bushy Point with an SUV. I believe there are vault toilets in that section, but for showers you will have to go over to the Blanco or Willow Creek CGs (only a few minuets down the road). Have fun!